Accomplish an end-of-year archive and reset (just in time for New Years). But first, I need to do some housekeeping. if testForComplete then MsgBox "All checks for last year have cleared. You can execute the End of Year Archive." I've introduced a couple of new things in this method that will run when the Check Register opens. Notice that I've declared d and d1 as dates and, at the same time, given d1 a value. A new date takes the value of the date and time at which it was created, so d1 is set to the date and time the application opens. Next, the function parseDate takes the string s, converts it to a date object represented by d, and returns True if s represents a valid date. Since s is set to the date in the "Brought Forward" line of transList, d.year + 1 is the year of the Check Register and is assigned to the integer systemYear. Then, since d1 is today's date, if d1.year is greater than systemYear we're now into the new year and the register would be eligible to be archived, as long as all the checks for the year have cleared. So, I immediately test that notion with the function testForComplete. If the function returns true then a message box, shown in Figure 1, alerts me that End-of-Year archiving can proceed. The property allCleared has been defined as a boolean (it’s either True or False) and is initially set True. Every transaction is then examined, and if its year equals systemYear and it hasn't cleared, allCleared is set to False and the For...Next loop exits. Otherwise, allCleared remains True. The function returns the value of allCleared and this value will be used later. I've found that doing a reconciliation at the end of each month by hand is time-consuming and fraught with errors, and for many people it is so much trouble that they just take the bank's word for how much is in their accounts. Having the ability to reconcile automatically was one of my initial reasons for writing this Check Register. This code assigns bbal to the initial Brought Forward balance, then steps through all transactions and, if the transaction is marked as cleared, adjusts bbal appropriately. I will add the findBankBalance method call to transWindow's new initialize method discussed previously. which insures that the cursor is located in this box when the window opens. The number group to the right of "Out of Balance" is also plain text. Upon opening, it will be initialized to the difference between the value of bbal and the value of statementBal. The terms nRecon and reconBbal have been defined as integers in the Reconcile window properties list. This code is similar to the code in Part 1 which loads transWindow transList. 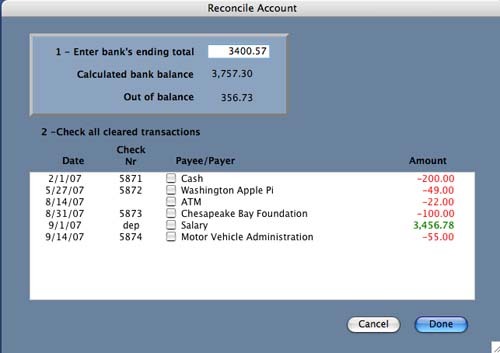 It first specifies the columns' configuration, then polls through each transaction in transList; if the transaction has been cleared (indicated by the check box), it adds the transaction to reconList and increments nRecon. Notice the line with the comment "transaction #." That command stores the counter i in column 4, which is not visible since its width is set to zero. That value, which represents the record number in transWindow transList, will be used later. This examines each entry: if the column = 3 (the Amount column) and the value is less than zero the entry is painted red. Otherwise, if the column = 3 the value must be greater than zero so it is painted green. Obviously this doesn't show in your Journal; you'll have to download the application to see it. All transactions in the bank statement that have cleared are checked in reconList. When each record is checked, the Out of Balance reading will change to reflect the current out-of-balance state until at the end -- we hope -- it will read zero. This is accomplished by the CellAction Handler. This code fires when a checkbox is checked in a record of reconList. When this is done all the records are examined; if the column 2 check box is True (checked), reconBal is recalculated and thus the Calculated Bank Balance and Out of Balance displays are updated. It polls each record in reconLis,t and if the associated check-box is true, it looks at the invisibly stored record number in column 4 and marks the associated check box in the transWindow transList record. It updates the bank balance, sets the flag showing data has been changed, and closes the window. Now I'll add a new Menu to the Menu Bar called Special and within that, a new Menu Item (Reconcile...). These are added in just the same way a Transaction Menu and its Menu Items were added in Part 3. This opens the Reconcile window and this step completes the addition of a reconcile function. What do I do at the End of the Year? Delete all of last year's transactions. This time I'll begin by adding a new Menu Item (End of Year Archive) to the Special Menu. It will be named “SpecialEOY.” However, I want that menu to be greyed out until the new year has arrived and all transactions for the systemYear have been cleared. Remember that the property allCleared, discussed earlier, was set True by exactly these conditions, so I'll use that variable to activate the SpecialEOY Menu Item. This is done in one of the transWindow Event Handlers called EnableMenuItems. I won't bore you with all the times that this handler is polled, but one of these times is when the operator clicks on a menu. Therefore, the following will execute to enable specialEOY whenever the Special menu is clicked. I'm also adding a test for the boolean variable, listHasChanged, to control the File-Save and File-Save & Quit menus. dlg.promptText = "Select Folder and Name for last year's data archive"
MsgBox "End of Year archiving is cancelled"
This one's rather long, but all the steps are really quite clear. First I declare two dates, lastYear and newYear. I then define lastYear as December 31 and newYear as January 1. Now I set s to the totalSeconds of lastYear. If you recall, in Part 1, I talked about totalSeconds (the number of seconds since January 1.1904). You'll recall, when the program loads the data file, each transaction's totalSeconds is stored in column 0 of transWindow transList. The only way RB can compare dates is by using totalSeconds, so I step through all the transactions to find the first one where totalSeconds is greater than s. This isthe first one of newYear. Subtracting one from the counter defines the index of the last transaction of lastYear. Using that index, I set the end-of-year balance -- eoyBalance. The method newYearFolder makes a new folder to archive last year's records. I'll examine newYearFolder in detail later. The next series of commands customizes a new Save As dialog box with the suggested name for the archived file. The variable fileArchive is defined as a FolderItem so the command: fileArchive = dlg.showModalWithin(self)makes fileArchive equal to the result of the dialog box. ModalWithin(self) presents a dialog within transWindow and prevents clicking in another Check Register window until the dialog is cleared by clicking in Cancel or OK. Once that is done, either the archive is cancelled or all of last year's records are written to the new archive file. The term eoyBalance is written into the Brought Forward cell, and the new year totalSeconds and date are written to that record. Next, each of last year's records is deleted and the counter nTransactions is reset to the actual number of records remaining. Finally, balances are recomputed, the remaining records are written to the Checkbook file, and the call to EnableMenuItems disables the specialEOY menu item. This first tests whether there is a folder within Documents named Archives,1 and if not, it creates one. It then tests for a folder with the name of the systemYear within Archives1, and again it creates one if necessary. When the Save As dialog is called by SpecialEOY above, it points to this folder. NOTE: If you download the application and run SpecialEOY it will create these folders in your Documents folder. Add an About Box with an application icon.